Schematic diagram of a fractured horizontal gas well completed in the Mancos Shale of the Uinta Basin. Induced fractures are several thousand feet below the fresh-water aquifer. The coupling of horizontal drilling and hydraulic fracturing of shale formations has been the most significant development in domestic hydrocarbon production in the past decade. But, as with many aspects of the energy business, controversy has accompanied it. To date, Utah has experienced little shale-gas production compared to other states. However, energy companies have shown interest in several shale formations in Utah, and Utah’s first commercial horizontally drilled natural gas well began production in the Uinta Basin in late 2010. 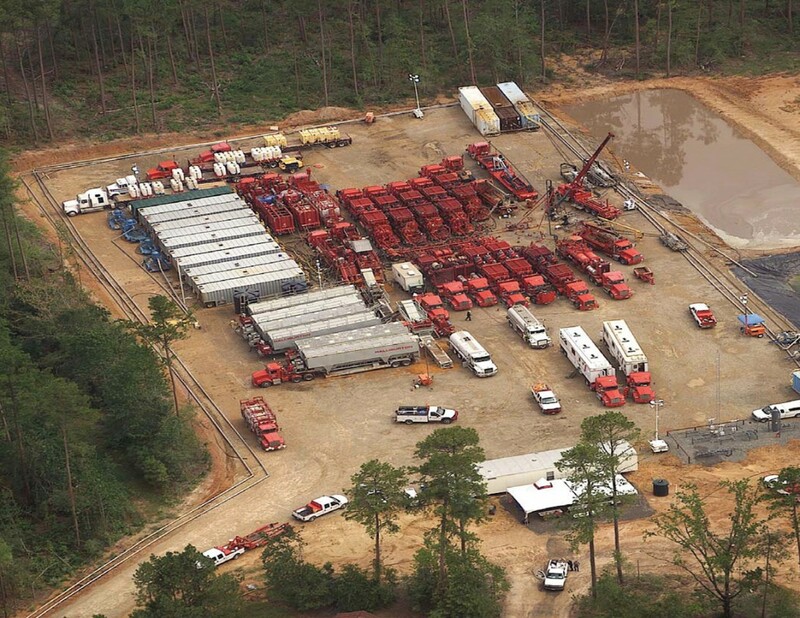 A review of the controversy that has grown around hydraulic fracturing is therefore timely. Geologists have long known that shale can contain significant amounts of oil and gas. But the small size of the pores in shale and their low degree of connectedness (i.e., low permeability) usually made extracting hydrocarbons from shale uneconomical. By artificially fracturing the rocks, drilling engineers can create cracks through which the natural gas will flow to the well bore in much greater amounts than would otherwise be possible. The technique of hydraulic fracturing (or “fracking”) refers to pumping liquids into the well under great pressure, thereby inducing the fractures. Frack fluids are typically about 95% water and 3% sand, which acts as a “proppant,” wedging into the fractures and keeping them open after the frack fluid is withdrawn. The remaining 2% of the fluid is chemicals that serve a variety of purposes—e.g., flow enhancers, scale preventers, bactericides—and whose precise composition depends on the characteristics of the specific frack job. Fracking is not a new technique; it dates back to the 1940s. About 35,000 wells in the U.S. are fracked annually, and the domestic total of fractured wells is nearly one million. Historically, most fractured wells were drilled vertically and the target reservoirs were sandstone or limestone. The current excitement about fracking stems from its use in horizontally directed wells to provide extended well contact with the heretofore noncommercial shale reservoirs. Like fracking, horizontal drilling has been employed for decades, but was relatively unused until technological advances allowed more accurately aimed and longer horizontal well segments. In horizontal drilling, the well is first drilled vertically to a certain depth (the kickoff point), then steered with a directional motor into a horizontal plane within the reservoir. The horizontal part of the well may extend thousands of feet, thus exposing a larger volume of the reservoir to the well than would be possible in a vertical well, and allowing more gas to be produced. After drilling, the hole is cased with pipe and cement to prevent collapse and to prevent fluid migration into permeable, non reservoir rocks. The actual high-pressure pumping of a frack stage lasts only a few hours, and several frack stages may be performed over three to five days. The fluid creates fractures about 1/10 of an inch wide, commonly widening natural fractures and exploiting weaknesses in the rock. The distance the fractures extend from the well depends on the fluid injection rate, the volume of fluid injected, and the rock’s physical properties, but is designed to stay within the target shale interval. Some of the frack fluid is retrieved from the well before natural gas production begins. The main environmental concern contributing to the controversy over fracking is that natural gas and frack fluids could migrate along the fractures and enter groundwater used for domestic or agricultural purposes. This is unlikely for several reasons. In most fracking operations the induced fractures are 2800 to 7500 feet below the deepest fresh groundwater aquifers. Engineers monitor the orientation of fractures during the process, and have strong economic and environmental incentives to prevent fractures reaching aquifers above the reservoir, because they risk losing the gas they hope to produce, and water flowing from aquifers would damage the gas reservoir. Several recent news reports have linked contaminated drinking water in Colorado, Ohio, and Pennsylvania to fracking. Investigations showed, however, that poor well casings, naturally occurring gas in the aquifer, or overpressuring a well during production were the causes. These are still environmental concerns, but suggest that the controversy over fracking per se is misdirected. The one instance where a causal link may exist between fracking and water contamination is at Pavillion, Wyoming, according to a draft report by the Environmental Protection Agency in December 2011. However, in Congressional testimony EPA officials emphasized that these findings were unique to Pavillion, where the fractured zones were as little as 400 feet deeper than some water wells, and did not imply that fracking was inherently unsafe. Earthquakes caused by fracking are another concern. Geologists have known since the 1960s that pumping fluids underground near active faults may cause “induced seismicity,” but induced earthquakes are typically very small. For example, Youngstown, Ohio, experienced several earthquakes up to magnitude 4 in 2011, near a disposal well that pumped used frack fluid underground. Youngstown sits above the northeast Ohio seismic zone, a region of moderately frequent naturally occurring earthquakes, and geologists determined that the well activated a previously unknown fault. The well operator agreed to shut down the well, and Ohio issued new regulations requiring geologic monitoring of new disposal wells. But since an induced earthquake is unlikely to be stronger than those that occur naturally in a given area, the risk of damage from fracking-induced seismicity is low in areas with no geological evidence for strong earthquakes. Another environmental concern is disposal of the used frack fluid. The fluid can be temporarily stored in lined pits at the frack site, but eventually must be pumped back underground or treated. Drilling companies are increasingly recycling used fluid in other frack jobs to conserve additives and reduce use of water and disposal wells. Regulations controlling fracking, well completions, and waste disposal are largely a matter of state law. However, Congress recently directed the EPA to investigate the safety of fracking regarding drinking water. A first draft of the report should be released later this year; the final report is due in 2014. Meanwhile, state laws on fracking are rapidly changing, mostly by requiring disclosure to some degree of the frack fluid compositions. Many companies voluntarily post the composition of fluids on the website http://fracfocus.org. By following the links on this site, the reader can find information on more than 400 hydraulically fractured wells in Utah. The great majority of the evidence indicates that hydraulic fracturing has been and can continue to be done safely.But as with any industrial process, careful planning and monitoring are necessary to prevent accidental environmental harm.